As a homeschooling family our mornings are busy with school work. Balancing school work with a two year old is less than desirable on most days. I'm trying really hard to keep him occupied with things other than the iPad or the TV. Enter playdoh. 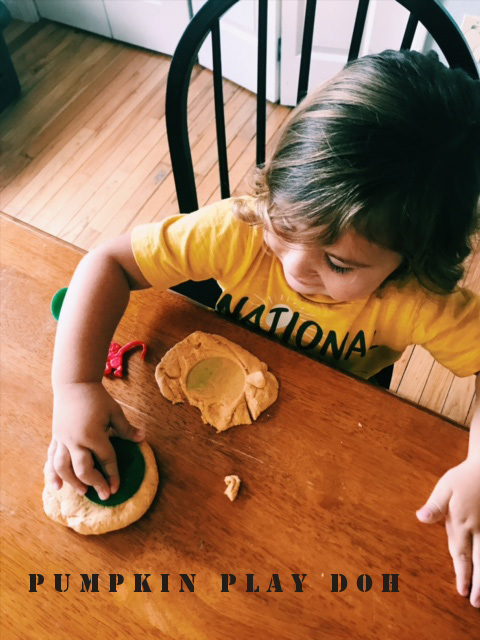 He LOVES play doh and honestly I need to go out and replenish our supply. He will sit and play with the stuff for hours. But right now I keep forgetting. While on Pinterest the other day I saw several recipes for pumpkin play doh. I checked the ingredients and had everything! So we made some. Now, I used Aldi canned pumpkin and had Aldi cornstarch in my pantry. I had to use the ENTIRE box of cornstarch, which tells me one of two things, either the cornstarch is crap or the pumpkin is super full of moisture, or both! I just dumped the can of pumpkin in a bowl and started to slowly add the cornstarch, mixing as I went along. I wanted a flubber like consistency, you know? Like Gak maybe, more like gak. I never achieved the consistency that I wanted, but I let Maverick have it anyway after we had most of the moisture out. He played with it for a good 45 minutes, so it was a win for that day. If I would do it again I would probably try to strain my pumpkin a little and buy better quality cornstarch, or just buy some play doh. ;) But this was a fun little fall thing to do and we did it.